From the thumping heartbeat of the distance runner to the roar of football terraces across the decades, Ben Wilkinson’s debut confronts the struggles and passions that come to shape a life. Beginning with an interrogation of experiences of clinical depression and the redemptive power of art and running, the collection centres on a series of vivid character portraits, giving life to some of football's legends. By turns frank, comic, sinister and meditative – ‘the trouble with you, son, is that all your brains are in your head’ – these poems uncover the beautiful game’s magic and absurdity, hopes and disappointments, as striking metaphors for our everyday dramas. Elsewhere there are tender love poems, political satire and strange dream worlds, in an urgently lyrical book of poems that take many forms and modes of address: pantoum, sonnet, sestina; epistle, confession, dramatic monologue. All are united by a desire to speak with searching clarity about matters of the heart. Way More Than Luck is a book that shows how pain often comes to define our happiness; how we keep on in a world of chance, uncertainty and change. 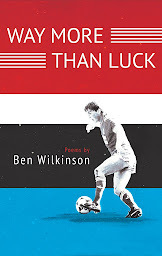 The beautiful game inspires some beautiful poems in Ben Wilkinson's terrific debut collection Way More Than Luck, but there's far more than football to focus on here. For Jung, Liverpool was the pool of life and this book is full of life too; politically astute, well-made and formally experimental poems celebrate even its sadness in fresh language, natural rhythms and subtle music. Wilkinson is, of course, also a well-known critic and writers he admires inform and are honoured in these pages, their various parts given unity by carefully-developed themes and imagery all served up with relish and humour. This makes for a very pleasurable as well as absorbing read that we are way more than lucky to have in one volume. It's clear that the love of the beautiful game extends to Wilkinson's poetics, for he embraces a variety of forms and modes of address. From formally dexterous sonnets and sestinas, to epistles and endearing confessionalism, this is a book that likes to keep the reader's on their toes. Something Wilkinson does well is navigate the dark abyss of clinical depression [...] from "going about / the tedium that strings our lives / together: paperchain people, / baskets lined under strip-lights" ('To David Foster Wallace'), to shivering over a beige Cornish pasty, "ticking over / before some godforsaken motorway service station" ('You Must Be Joking'), there is tenderness and touching honesty to be found in the darker moments he describes. For this reason the collection's title is apt, for its scope reaches way beyond the boundaries of the football pitch and the fabled buzz of excitement, which rather serves as a backdrop against which the poet can stand and inspect the the state of his own thumping heart. Published by Seren Books, February 2018.